Alyssa and her boyfriend at left. The Pumpkin Spice Lattes at right. Today is September 29, 2013. They say that focusing on others is a good way to ease your sorrows. A number of exemplary parents are taking that advice to heart in honor of their children who have died. On September 4, only 25 days ago, Alyssa Josephine O’Neill died from an epileptic seizure. She had been diagnosed with epilepsy only one year before. She was 18 years old, the oldest of the four O’Neill children. The night before she died, she texted her mother from her bedside, saying she noticed that Starbucks had brought out their annual September specialty drink, Pumpkin Spice Latte, and she wanted to get one. Her mother agreed to take her to Starbucks before school the next day for the treat. The following morning Alyssa had a seizure and died before she could fulfill her last wish. 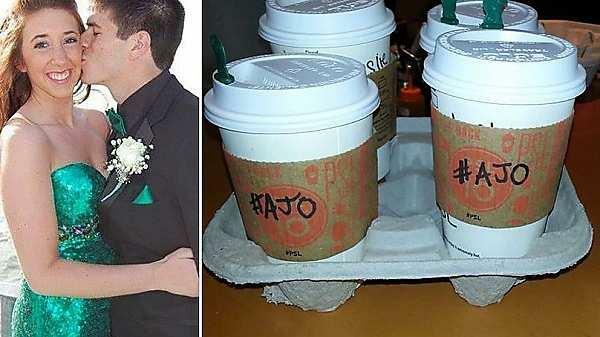 Two days after her funeral, her parents, Jason and Sarah O’Neill, decided to honor their daughter’s wish by buying 40 lattes at the local Starbucks. They explained to the manager that whenever a customer ordered a Pumpkin Spice Latte, they were to be told that it had been paid for, and requested to pay the favor forward to someone else. 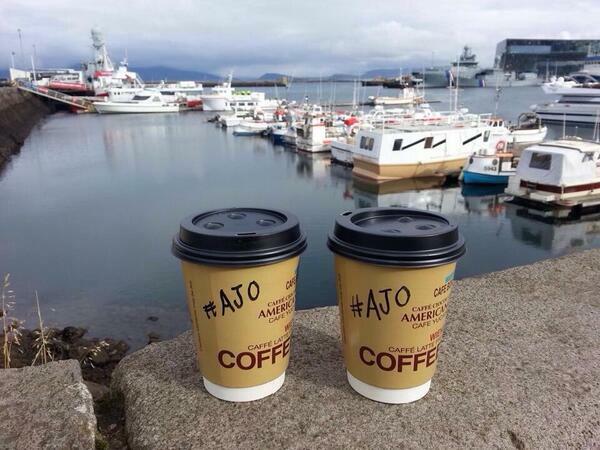 The Starbucks employees were so moved by the parents’ gesture that they pooled their funds to buy 50 more lattes, each marked with the hashtag #AJO, Alyssa’s initials. The O’Neills’ gesture has gone viral around the world, thanks to social media, where their daughter’s Facebook memorial page has had over 33,000 likes around the world, and you can donate through PayPal to the AJO Forever Fund. People are sending in Instagram photos from all over the world, including places like China, Iceland and Afghanistan. The parents are gratified that their gesture has gone viral, since part of their effort was to raise awareness about epilepsy. Grieving parents doing something in honor of their children is not a particularly new idea, although social media brings it to our attention much more rapidly these days. Back in 1910, Georgiana Klingle Holmes started an orphanage for orphans, half-orphans and “destitute” children in Summit, New Jersey, in honor of her son, Arthur, who died after being bitten by a rabid dog in 1881. Arthur’s father was Col. Benjamin Holmes, a Civil War veteran. When Arthur died, he was Georgiana and Benjamin’s only child, but another son came along in 1883, named LaRue. Unfortunately, LaRue died young, as well, at the age of 22, of “rheumatism” of the heart. (I’m thinking perhaps he had rheumatic fever, which affected his heart.) For that son, Georgiana started a nature center which works with the local public schools. In those days, people didn’t do this sort of thing in honor of their children, perhaps because it was much less rare for a child to die young. Georgiana was certainly ahead of her time. 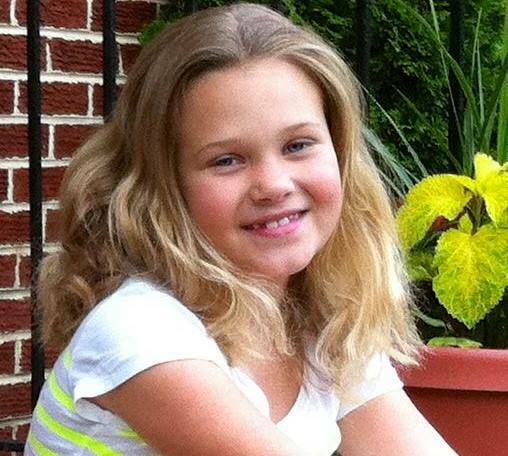 Jessica Nicole Lee was only 11 when she died of acute myelogenous leukemia. 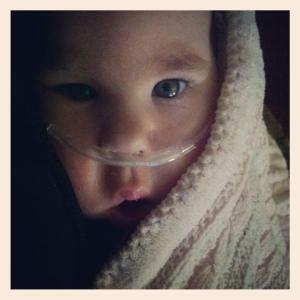 She was diagnosed on February 15, 2012, with the disease, and died on October 4, 2012. Her parents, Jody and Shelley Lee, created the Jessica Lee Foundation to raise awareness of childhood cancer, and to assist other families whose children are battling the disease. 60% of the money donated goes to research at the Aflac Cancer and Blood Disorders Center at Children’s Healthcare in Atlanta. The other 40% goes to actual families at the Aflac Center. A couple from Philadelphia is mourning the death of their firstborn infant daughter, Ana Cru Mallory. Parents Tom Mallory and Kate Koehn created a charity in memory of their daughter, who died just last August in her father’s arms, while her mother sang to her. During Ana’s time in hospice, the parents noticed that many medical supplies were never used because their daughter grew out of them. They were told to throw the unused items away, but rebelled, thinking that it was a shame that perfectly good, unused and still sterile items might go to waste. That’s when they started collecting the items to be given to someone else in need. Their project is called Project Sloopy, which you can read about on their website. They want to be a lifeline to families who might not be able to get medical supplies for their children through insurance. Their mission statement says, “The mission of Project Sloopy is to reduce the amount of domestic medical waste, and precipitate growth by salvaging excess and unused medical supplies from families of special needs children that grow out of their supplies, home care patients, hospital surplus and redistribute them to families that need them, both domestically and worldwide.” Tom and Kate have been traveling around the country, raising awareness for their charity. Janice and Bill Davis of Pearisburg, VA, lost their son, Mark, in 2000. He was 42 when he died, and worked as a welder in Indiana who worked repairing stadiums. 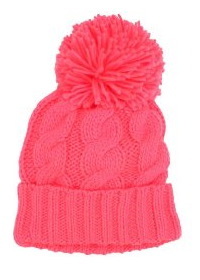 Janice says that when Mark fell on hard times, he found a place to stay at a homeless shelter in Roanoke, VA. After his death, Janice wanted to do something in his memory, so she began to knit “toboggans,” which is a word Southerners use to describe knitted hats that are called “beanies” in the North. (The word “toboggan” means a simple snow sled without runners in the North.) Janice decided to donate the caps to the shelter in Roanoke for homeless folks. She knits about three each day, and as of June this year she had made about 50 of them. Once Janice’s sister, whose daughter Joni died in 2010, heard about her project, she asked Janice to knit 100 caps in memory of Joni. 20 of the caps Janice had knitted by June will be donated in memory of Joni, and the other 30 were earmarked for the shelter in Roanoke in honor of Mark. If she has kept up her schedule of knitting 3 caps per day, Janice should be finished knitting the ones for Joni by now. The article I read did not say how long Janice plans to continue knitting the caps in honor of her son. On December 22, 2012, the Bacho family van was traveling through an intersection in Newman, GA, when a truck driven by a teenager ran a red light and smashed into the side of their vehicle. Inside were the entire Bacho family, including Abby, her parents Natalie and Stephen, her two sisters, and her grandfather. Other members of the family were taken to the local hospital with less serious injuries, but Abby and her father were flown to hospitals in Atlanta, where Stephen was put into a 4-week induced coma, from which he eventually recovered. Abby was not so lucky. She was taken off life support on Christmas Day, 2012. The family donated her organs. During their time in the hospital, the family received a great deal of support from their community, and wished to show their deep gratitude. Remembering how Abby loved to play school with her younger sister and a neighbor child, playing teacher to the younger children, her parents decided to donate school supplies to needy children in their area. They knew how delighted young children are to receive new school supplies, and how these things can help spur a love of learning in children. In each school, a space called “Abby’s Closet” is created, and one contact person is in charge of maintaining the closet and distributing the supplies without fanfare to needy children. About the same time as the foundation was formed, Natalie and Stephen’s niece began to make bracelets that they now sell to raise money to donate the school supplies. They have sold more than 500 bracelets, pictured on the Abby’s Angels Facebook page. Anyone wishing to make contributions to the foundation can do so by writing a check to the NCF (National Christian Foundation) with a memo in care of Abby’s Angels Foundation. The NCF address is 11625 Rainwater Dr., Alpharetta, GA 30009. All proceeds go directly to Abby’s Angels. On September 1, 2013, the Thornton family lost their son, Joshua, who died at age 11 of leukemia after suffering through radiation, chemotherapy, and a bone marrow transplant for two years. During Joshua’s nearly 200 days in the hospital, his parents, Danny and Sarah Thornton, noticed that their son seemed to find comfort in playing with Legos. Once in a while at hospitals in Macon and Atlanta, GA, there were no Legos to play with, and Joshua’s parents never forgot the look of disappointment on their son’s face. 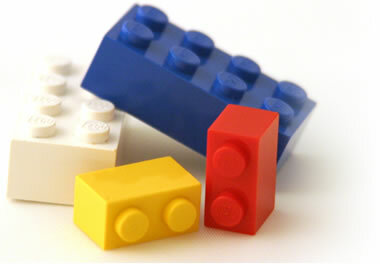 Donations of new Legos in their original packaging can be dropped off at or mailed to the Warner-Robins Chrysler-Jeep-Dodge dealership at 2817 Watson Boulevard, Warner Robins, GA 31093-8511. The phone is (478) 971-7777. For more information, you can also email joshuasmiles@hotmail.com. And finally, Bruce and Sara Mattice lost their son, Steven Bruce Mattice, in an ATV accident back in May 1999. Steven was 14 when he was killed, an 8th-grader at the time. He would have graduated with the class of 2003. The family had just moved to Fulton, Indiana from the Muncie area, and Steven had only been attending school in Fulton for about five months when he was killed. Still, his new friends rallied around the family and attended the funeral wearing yellow ribbons. Every year since that time, school children in Fulton wear yellow ribbons in Steven’s memory. Grateful for the support of the community, Bruce and Sara created the Steven Bruce Mattice Scholarship Fund, and they donate financial support to the winners of the annual Fulton Bulldog 5K Race, the most recent of which was held on August 3, 2013.